Despite Kohli's heroics, India couldn't win the game as Shimron Hetmyer and Shai Hope did a fabulous job in the run chase to deny the hosts a victory. 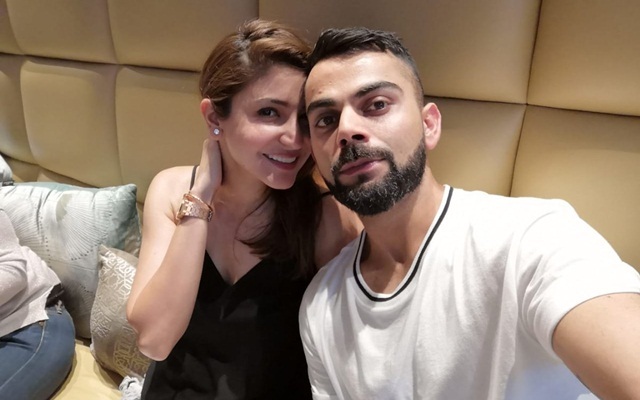 Ever since Anushka Sharma and Virat Kohli bonded their relation in holy matrimony, the Indian skipper has been in outrageous form and maybe the lady luck is playing its part. The duo are always vocal in terms of supporting each other in their respective professions and never back down in expressing their love for each other. The Indian captain attained something very special on Wednesday which was previously achieved only by 4 Indian cricketers. He became the fifth Indian and 13th overall to complete 10,000 runs in ODIs and the manner in which he got there made the social media go nuts over his consistency. 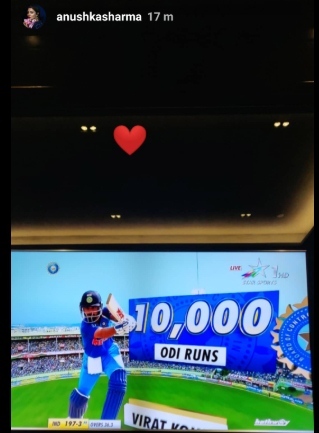 On 29th October last year, he completed 9,000 runs in ODIs and inside 365 days, he got to the 10,000 mark in his next 11 innings at an average in excess of 145. After mustering a match-winning 140 in the first ODI, the 29-year-old once again scored a big hundred and continued his golden run. Despite all his heroics, India couldn’t win the game as Shimron Hetmyer and Shai Hope did a fabulous job in the run chase to deny the hosts a victory. It seemed like the Windies would end up winning the game, but some outstanding death over bowling from the hosts helped them finish the game on level terms. Kohli was adjudged the Man of the Match once again this series. 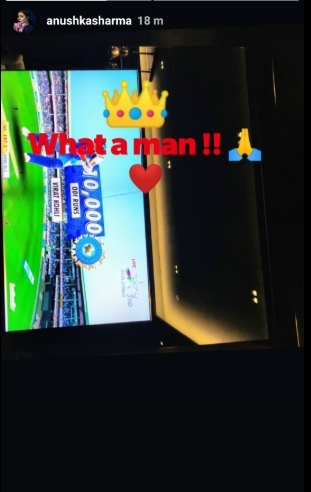 Anushka Sharma tries her best to accompany her husband to the matches he plays, but she couldn’t make it to Visakhapatnam. Nevertheless, she enjoyed all the action on Television and posted quite a lot of stories on her official Instagram handle. The 30-year-old was clearly over the moon and her elation was totally palpable. She posted three stories via her official Insta handle, the first two included pictures of him getting to the humongous 10,000 landmark. 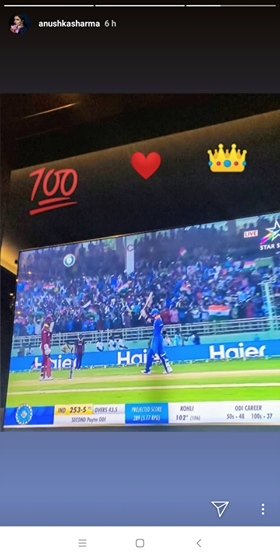 The 3rd one was the moment when he got to his 37th ODI hundred and she put a small crown emoji in the background, suggesting who the king is. Get the latest Cricket News and updates from India vs West Indies series, Match Predictions, Fantasy Cricket Tips and lots more on CricTracker.com.